Winter 2011 catalog NOW AVAILABLE! 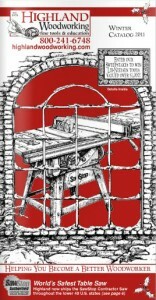 It’s either in your mailboxes or on its way, but if you haven’t seen it yet, now you can take a look at the Winter 2011 HIghland Woodworking catalog ONLINE. Browse the pages, start making your gift list, and leave it conspicuously up on the screen of every computer in your house so your loved ones will get the message! If you prefer the paper version but are not on our mailing list, you can sign up here.